If you’re looking for a lightweight action camera that is rugged, waterproof and jam packed with the latest recording features, the search stops here. Simple one touch and voice control operation makes starting and stopping your video fast and easy. 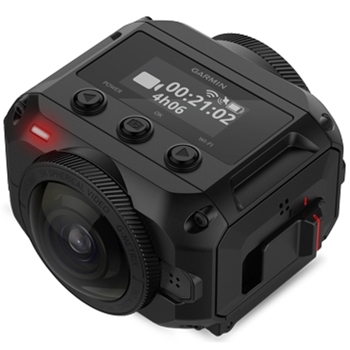 Record 360 degree video with up to 5.7K/30fps resolution via the built in-omni directional camera that seamlessly overlaps the video for one continuous feed whether vertical or horizontal you’re good.The Hyperframe Director Mode allows users to reframe video content with smooth camera pans and wide angles. Photos taken with the Virb 360 also enjoy the benefits of this high resolution picture. Whether extreme trail riding or sky diving, the 4K spherical stabilizer keeps the video recording steady regardless of any erratic movement the user makes. Garmin's Raw Stitching technology allows users to stitch raw video together to achieve a smooth and seamless end product. The 10HZ built-in GPS with GlONASS keeps you in tune with your exact location no matter how remote your location may be. Built-in sensors include a barometer which is extremely helpful in keeping track of pressure in the atmosphere. The compass, and gyroscope aids in managing orientation as you move. Add up to 128 GB of storage on a micro SD card allowing you to have an abundance of recording and picture taking room available. 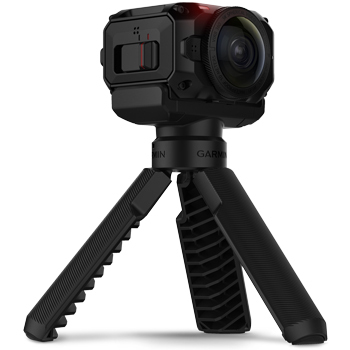 The Virb 360 can be mounted on universal action and tripod mounts, and is waterproof to 10 meters. The lightweight 5.6oz size will not feel heavy or cumbersome if you choose to wear your VIRB. The Virb 360 also has a 360-degree audio feature that is perfect for letting your viewing audience capture your adventure with not only sights but sounds, like the waves crashing behind you as you surf, or just hearing your excitement as you take your wildest adventures to the limit! The 15 megapixel resolution camera has several modes for capturing stills like burst shots, time lapse, and travelapse for those times you wish to condense a video in smaller fragments. The Virb 360 comes with a replaceable glass cover lens, and a re-chargeable lithium-ion battery that provides up to 1 hour. The 360 also has the ability to interface wirelessly through Bluetooth, Wi-Fi or ANT+. When you add on optional sensors to the 360 you really begin to see that this camera is capable of; like cadence, heart rate, temperature just to name a few of the additional features. G-Metrix sensor within the Virb 360 is perfect for almost any sport- snowboarders and skiers can see jump height and distance, roll and pitch, as well as rotations and hang time. Streaming your video on social media apps like Facebook live, and YouTube lets you share your amazing adventures with the world via an Apple device. Utilize the free VIRB Mobile app, or desktop software for video editing, add data overlays to content and share. 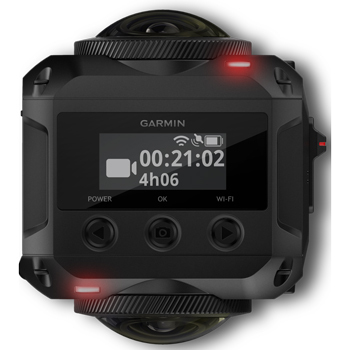 Garmin has made the Virb 360 action camera so easy to use, and lets you capture the moments in life as they happen. With Garmin VIRB's extensive mounting options you can capture nearly any adventure. Use the Large Tube Mount on handlebars, seat posts, roll bars and more. Fits tube ranging in size from 0.75 inches to 1.5 inches (19 mm to 38 mm)Compatible with VIRB X, VIRB XE and VIRB Ultra 30. Compatible with your Garmin VIRB X, VIRB XE, VIRB Ultra 30 and VIRB 360 this heavy duty adhesive mount is perfect for flat or curved surfaces. Swivels easily to capture video from nearly any angle. Includes 3 flat adhesive mounts, 3 curved adhesive mounts, pivoting mount adapter, long screw and wrench. With Garmin VIRB's extensive mounting options you can capture nearly any adventure. Use the Small Tube Mount on ski poles, roll bars and more. Fits tube ranging in size from 0.35 inches to .95 inches (9 mm to 24 mm)Compatible with VIRB X, VIRB XE and VIRB Ultra 30. 32GB Class 10 microSDHC with SD Adapter Blank. microSD Ultra 64GB Class 10 HC with SD Adapter Blank. The VIRB 360 Rechargeable battery enables you to keep the adventures rolling. Whether a backup or a replacement, this 1250 mAh battery lasts up to 1 hour and 5 minutes at 4K/30fps stitched in camera or 5K/30fps unstitched. Windshield Suction Cup Mount for your Garmin VIRB XE, VIRB X, VIRB Ultra 30 or VIRB 360. Mount your Garmin VIRB XE, VIRB X, VIRB Ultra 30 or VIRB 360 to your surfboard, kayak, boat or wakeboard.